Membership Growth... the work starts with each one of us! JUNE 2007 -- An unofficial count of 78 attended the Membership seminar conducted by Ed Luttrell of Eagle Creek, Oregon, Leadership Membership Director of the National Grange. Barbara hit it just right. Ideas can be planted, but the task as putting these ideas to work is ours. Mr. Luttrell said we had 11 Grangers with a membership net gain in 2006. These Grangers are: Beacon No. 118, Bethlehem No. 121 , Brooklyn No. 43, Enfield No. 151, Eureka No. 62, Granby No. 5, Harmony No. 92, Old Lyme No. 162, Taghhannuck No. 100, Totoket No 83 and Tunxis No. 13. 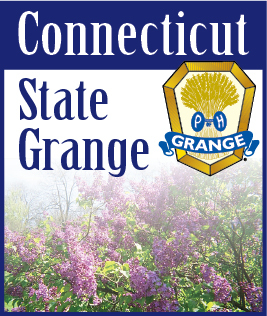 Is your Grange on this list? Will your Grange be on the 2007 list?? Thanks to East Central Pomona for the use of their hall and to everyone who came, those who “volunteered” to bring refreshments and those who helped with the set up and clean up. Your help was sincerely appreciated.